Taped to Julia Jacklin’s guitar are two messages written in black sharpie. One is the practical “Julia’s guitar” label. The other was a little more surprising: a scribbled “you’ve got this!! !”, complete with three exclamation points of encouragement. It’s hard to believe the necessity of the second taped message because it is hard to believe anyone with Jacklin’s talent could be nervous about playing a show. Crushing, Jacklin’s second record was released a week ago. The Australian artist’s second album is a consistent and endearing collection of songs that waver between themes of heartbreak and the freeing independence that comes afterwards. The record plays to her strengths, filling empty spaces among guitar strums with lingering vocal prowess and beautiful poetic lyrics. The vivid pictures Jacklin paints with her songs translated effortlessly to a live setting at Avondale’s Hollywood venue. Opening with the haunting motions of the first single from Crushing called Body, Jacklin was hypnotic as she sung about the tethers of a failed relationship, and reclaiming her sense of self in the aftermath. Her band pair with the songs perfectly, helping to lift her songs to a trance-like level. Jacklin asked hesitantly if anyone had actually listened to her entire new album since its release, reassuring everyone that it was okay if they haven’t, attention spans are short in the streaming world we live in. 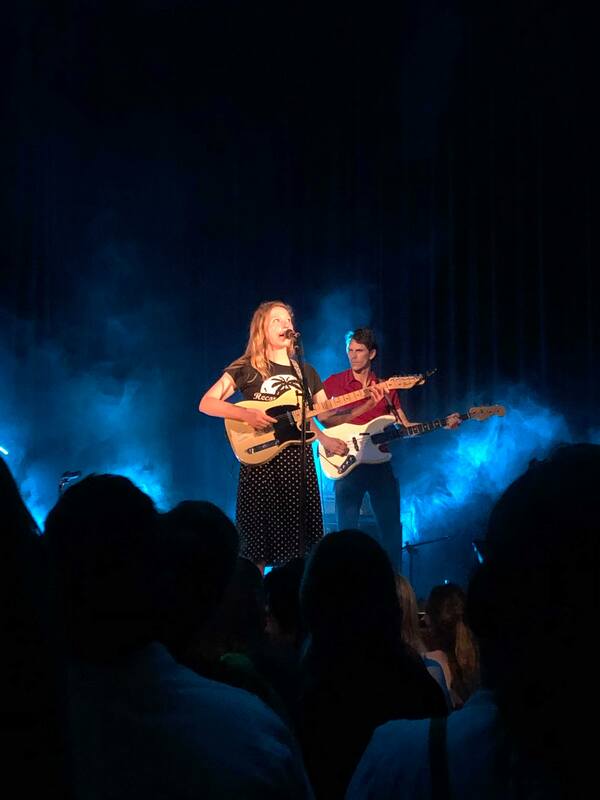 The crowd met her query with an enthusiastic whoop that said otherwise, suggesting that the people who attend Julia Jacklin shows are the type of people who probably own vinyl records and digest albums in their entirety. The crowd is split almost evenly between older fans and millennials, representative of her wide-reaching appeal for her indie-pop and folk sound. Songs from her debut record Don’t Let The Kids Win were met with enthusiasm and sing-alongs, but none too loud to overshadow Jacklin’s vocals – a notion of respect from the audience. They were there to hear her voice and not drown it out. In fact, the show had sentimental value to it – Jacklin had recorded her first album in Lyttleton, and she was stoked to be starting the tour for her second back in New Zealand. A full circle moment. Jacklin interjected between songs with short anecdotes – many of which were annoyingly interrupted by overzealous drunk men. Nevertheless, she pressed on with her tellings and remained in control of the crowd, instructing everyone to “settle down, this one’s a sad one” before launching into the track Turn Me Down. She also joked about her band not quite having an organised costume similar to opener Merk, who wowed the early-comers with an energetic set complete with a band wearing co-ordinated striped shirts. Jacklin’s stage presence lent itself to a degree of relatability with her admission of nerves and interjections of humour, but this was juxtaposed almost immediately with a jaw-dropping performance when she started another song. As her set continued, the reasons for taping the message of encouragement become clear. She explained sheepishly that she had the lyrics to Motherland stuck to the stage floor in case she forgets any of the lyrics although the safety net was in vain thanks to lighting which made the pen disappear. Despite the nerves, she managed to get through the song without a hitch and the rest of her performance was faultless, disregarding a brief, almost unnoticeable stumble with the opening lyrics to a song from her new album. The error was nothing more than a tiny blip on an otherwise flawless, raw, and stunning performance. The parts of the set that also shone were the antithesis to the stripped-back ballads that made up most of her set. The last three songs Pool Party, Head Alone, and Pressure to Party were upbeat and dance-inducing. The euphoric bridge of Head Alone had the crowd almost screaming, “I’ll say it, ‘till he understands / you can’t love somebody without using your hands”. She closed the main set with the Pressure to Party, a fast-paced song and stand-out track from Crushing about ignoring the peer pressure to go out and meet a new lover after a breakup.